To Cite: Taeidi E, Montazeri S, Behroozi N, Haghighy Zadeh M H, Ahmadzadeh Deilami A. The Effect of Problem Solving Therapy on Breast Cancer Women, Int J Cancer Manag. 2018 ; 11(9):e69336. doi: 10.5812/ijcm.69336. Background: Women with breast cancer experience major problems. One counseling method improving mental health is problem solving therapy (PST). Since psychological wellbeing is a measure of mental health, individuals with poor psychological wellbeing are subject to depression and anxiety. Therefore, improvement of psychological wellbeing results in physical and mental health. Objectives: The purpose of this study is to investigate the effect of problem solving therapy on the psychological wellbeing of women with breast cancer. Methods: This clinical trial was performed on 34 women affected with breast cancer. Convenience sampling was employed to collect samples in Shafa Specialty Hospital of Ahvaz, Iran (2017). Patients were randomly assigned into intervention (n = 17) and control group (n = 17). Problem solving therapy was applied in 8 ninety-minute sessions weekly. The Data were gathered using the demographic questionnaire and Ryff 's psychological wellbeing questionnaire, including 84 items. In a one-month follow-up study, the patients filled in Ryff’s psychological wellbeing questionnaire again. Results: The results of investigating the effect of group problem solving therapy on psychological wellbeing revealed that the average of psychological wellbeing of pretest, posttest and follow-up study of the weekly intervention group was 240.94 ± 4.84, 421 ± 11.11, and 429.52 ± 10.94, respectively. In fact, all scores showed an increase. However, the scores of the pretest and follow-up study of the control group showed no increase. The highest score belonged to environmental mastery dimension. The mean of environmental mastery of intervention group in pretest, posttest and follow-up study was 40.00 ± 4.18, 76.11 ± 2.54, and 77.05 ± 2.10, respectively. Therefore, problem solving therapy improves the psychological wellbeing of the patients (P < 0.05). Conclusions: Problem Solving Therapy can be applied to improve psychological wellbeing of women with breast cancer. Breast cancer has been considered as a common and worrying disease among women around the world (1). According to statistics, more than one million new cases are annually diagnosed with the disease (2, 3). In some Asian countries such as Iran, more than 502000 women are annually put at the risk of death due to breast cancer (4). Detection of breast cancer is an extremely unpleasant and unbelievable experience for all individuals (5). The disease changes the life of patients and presents many physical, mental, social, economic, and family problems for them. The mental effects of detecting cancer and the physical effects of treatments produce many side effects, which negatively influence the quality of life (6). Long duration of treatment and related issues during breast cancer surgery, chemotherapy, and radiotherapy cause many problems in patients’ routine life (7). In fact, the stress caused by breast cancer has declined women’s mental health and well-being and has led to their hopelessness and despair (8). Psychological well-being means positive feelings and overall life satisfaction, which includes being satisfied with self and others in different areas of life (9). Nowadays, researchers believe that providing people with psychological well-being and life satisfaction leads them to more success in life, better health, healthier supportive social relationship, and improved physical and mental health (10, 11). Women with breast cancer suffer from a high level of stress during the process of diagnosis, treatment, and their quest for survival; so, their mental health, psychological well-being, and course of disease are affected (12). Almost 20% to 40% of women with breast cancer report a significant clinical level of depression during or after treatment (13, 14). Thus, psychological counseling and mental-social support are needed during the course of disease to improve the quality of life and psychological well-being of them (15). Problem solving therapy, as a psychological intervention, enables us to shift the focus from the disease to solving the problems caused by it (14). That is why this particular therapy is chosen as the effective intervention in this group of patients. Various interventions such as psychological methods to improve disturbed thinking and reasoning, stress management, etc. are employed to reduce depression, distress, and pain in patients with breast cancer (15). Since diseases like cancer have a significant impact on the mental health of the patients, studies focused on effective intervention are of absolute importance. Therefore, the purposes of investigating the effects of an intervention on psychological well-being include reducing psychological trauma, improving behavioral, and mental function to prevent the recurrence of previous problems, producing new clinical problems, and maximizing overall life quality of cancer patients (14). Even though women's psychological well-being is significantly affected by breast cancer, no substantial regular counseling program has been presented for the patients, and we found no research on the effectiveness of problem-solving therapy in improving their psychological well-being. Therefore, the aim of the present study is to investigate the effect of PST on women's psychological well-being with breast cancer. The present study is a clinical trial experiment with 2 pre- and post-test stages, in which participants have been randomly assigned in 2 groups (Figure 1). The statistical population was selected through convenience sampling and included all women with breast cancer, who visited Shafa Specialty Hospital of Ahvaz, Iran from October to June, 2017. Thirty-eight participants were selected and randomly assigned into 2 groups: Control (n = 19) and intervention (n = 19). In this study, the inclusion criteria were as follow: 1) Patients older than 18 years old, 2) patients whose disease had been diagnosed definitely at least 6 months ago, 3) patients who had received at least 9 years of education, and 4) patients with one standard deviation (SD) smaller scores than mean in the psychological well-being test. The exclusion criteria were as follow: 1) Patients with mental illnesses history, 2) patients taking psychiatric drugs, 3) patients with severe physical health problems or other types of cancer, and 4) addicts. On obtaining a written consent from the patients, they filled in Ryff's psychological questionnaire. The intervention included 8 weekly sessions designed based on the Nezu’s problem-solving model by the author and consultant professor in order to improve the psychological well-being of patients with breast cancer. The participants filled in the psychological well-being questionnaire. Thirty-eight participants, whose scores were less than 242, were selected and randomly assigned into intervention group (n = 19) and control group (n = 19), using a table of random numbers. The intervention group participated in weekly PST program. The problem solving theory (PST) program was focused on such problems as coping with cancer symptoms and the difficulties of treatment. During the experimental phase of the study, 2 participants were excluded from the intervention group. Also, 2 participants were excluded from the control group, so that the groups were symmetrical and compatible. Finally, 17 individuals in the intervention group completed 8 sessions of PST protocol. The PST protocol consists of the following steps: Assessing the problems, setting an achievable goal related to problems, generating solution, choosing the solution, implementing the solution, and evaluating the outcome. In the last session and 1 month later, both groups filled in their psychological well-being questionnaire again. In order to follow ethical guidelines, a brief course of PST was given for the participants of the control group. Psychological Well-being Inventory: The questionnaire is a self-report criterion for positive feelings and overall life satisfaction, established by Ryff (1989). The original version includes 120 items, but later investigations provided versions of 84, 42, and 14 items. We applied the version of 84 items. The questions assess 6 dimensions of psychological well-being based on a 6-point Likert scale (1. Completely disagree to 6. Completely agree): Autonomy, environmental mastery, personal growth, self-acceptance, positive relation with others, purpose in life; participants choose one point for each item, and the scores range from 84 to 504. Higher scores indicate higher psychological well-being scores. Van Dierendonck reported that internal consistency of micro scales was appropriate and Cronbach's alpha was between 0.77 and 0.90 (16). In Iran, Bayani et al. examined the reliability of the scale and used Cronbach's alpha to assess internal consistency. Environmental mastery, positive relation with others, personal growth, self-acceptance, purpose of life, and autonomy were 0.77, 0.77, 0.78, 0.71, 0.70, and 0.82, respectively (17). In this study, the Cronbach's alpha of questionnaire was 0.70. To obtain the score of each participant for each dimension, we added up the scores of related questions. Adding up all scores, we obtained the total score of the questionnaire. A total score lower than 242 indicates poor psychological well-being. We used SPSS Statistics V22.0 to analyze the data. We used independent t-test and Chi-square test to compare quantity variables and quality variables, respectively. Also, to compare the results of pre-test, post-test, and one-month follow-up, we used repeated measures analysis of variance; on examining the significance of these 3 stages, least significant difference (LSD) test was used to make a pair wise comparison. The study was approved by the research Ethics Committee of Ahvaz Jundishapur University of Medical Sciences, Ahvaz, Iran (IR.AJUMS.REC.1395.589). Informed consents were obtained from all participants and each one received a code to be unknown. This study was registered in the Iranian Registry of Clinical Trials (IRCT2017011431940N1). Thirty-eight women with breast cancer were recruited, but 34 individuals remained in the study. Two members of the intervention group did not accept to cooperate and were eliminated. So, we excluded 2 members of the control group as well (Figure 1). Since all the information was gathered by the first researcher, there was no missing value considering the sample size. The mean age of participants was 44.64 ± 11.68 years. There was not a significant difference between the groups in terms of age, education level, job, salary, marriage duration, birth control method, method of treatment, marital status, and number of pregnancies. Table 1 lists sociodemographic characteristics. Kolmogorov-Smirnov test showed that the distribution of data was normal. a Values are expressed as No. (%) or mean ± SD. The Psychological well-being scale (PWBS) scores of the groups prior to the intervention program are represented in Table 2. The results of the independent t-test show that there was not a significant difference between the total score of PWBS of the groups prior to intervention (P > 0.05). Before the study, both groups were consistent in PWBS (P = 0.05). Table 2 presents the scores of PWBS and all dimensions in the groups before and after PST session. The result of repeated measure analysis revealed a significant differences in the experimental group in all dimensions after the intervention (P < 0.05). While the scores of the control group were lessened (P < 0.05). In addition, the follow-up assessment at 1 month post-intervention revealed a significant effect. In general, the results revealed that the mean total score of psychological well-being were lessening after the intervention and 1 month post-intervention in the control group. However, there was a significant difference in the experimental group after the intervention and 1month post-intervention (P < 0.05). According to the findings, the PST program was able to improve the psychological well-being of the patients and changes were maintained until the follow-up stage. In line with our findings, the results of Hirai et al. (12) and Tsuchiya et al. (18) suggest the effectiveness of problem-solving therapy in helping patients with breast cancer and patients with lymphedema symptoms to cope with the diseases, and changing their negative beliefs during the therapy procedure. Contrary to the findings of the present study, the results of Mayer et al. suggest the effectiveness of PST to increase psychological well-being of patients suffering from advanced cancer, although it was beneficial in improving the quality of life of patients (19). Due to the fact that in the PST program, there are techniques to improve psychological health including skills for detecting negative self-proclaimed thoughts and challenging them, setting goals for improving self-care is important. Moreover, positive physical activities and successful problem-solving techniques in the “mind’s eye” are recommended, which lead to creating feelings of optimism and self-sufficiency (14). Therefore, it seems that PST improves the psychological well-being through affecting the mentioned cases. The findings of this study are also aligned with studies of Lyons et al. (20), and Hegel et al. (21), which suggest that PST is effective in coping strategies and improvement in patients with functional limitations and health-related behaviors. This therapy causes fundamental changes in the beliefs, attitudes, feelings, thoughts, and emotions of the patient. For this reason, the patient would innovate adaptive ways in facing life stressors. These techniques help patients to become conscious towards their emotional stresses, release their past emotional patterns, and develop the new emotion of mental and physical inhibition. The scale we used (Ryff's questionnaire) assesses dimensions such as autonomy, environmental mastery, personal growth, self-acceptance, positive relation with others, and purpose of life. Although few studies have been conducted on the effects of PST on subscales of psychological well-being, findings of other similar studies are aligned with those of the present study. In the same way, studies by ForghaniTorfi et al. (22) and Heidarianfard et al. (23) suggest that cognitive behavioral therapy has a significant role in increasing the autonomy among students. Furthermore, findings of Isazadegan et al. suggest that cognitive behavioral therapy is effective in increasing the self-efficacy and environment dominance in obese women (24). The findings of the current research also agree with those of Modares et al., confirming the effectiveness of teaching problem-solving skill on interpersonal communications among midwives (25). Based on the findings of this study, Seyedmoharrami et al. (26) and Omrani et al. (27) suggest the effectiveness of cognitive behavioral therapy on the aspects of achievement motivation and purposefulness. Also, in line with our findings, Moatari et al. (28) reported the effectiveness of problem-solving in undergraduate students, and results of the study conducted by Bayat et al. (29), confirming the role of cognitive behavioral therapy on the subscale of self-acceptance among children. It seems that PST program in the present study was able to provide an opportunity for patterning from successful behaviors, using emotional interactions among the patient group and psychological skills training, and increased resistance to social pressures among the patients. In the course of problem-solving therapy, the necessary skills for solving disease-related problems are acquired, positive thinking strategies are taught, and self-awareness is achieved. Therefore, our findings lead to an increase in purposefulness and self-acceptance. On the other hand, the program, through affecting the attitudes and false beliefs, leads to an improvement in social skills among the patients and their satisfaction in meeting their physical, psychological, and spiritual needs. Therefore, these cases have successfully improved the psychological well-being among the participants. Considering the fact that breast cancer can lead to dissatisfaction and experiencing various negative emotions, and this causes lack of acceptance of condition, declined health potential and quality of life, and sometimes re-hospitalization and premature death (30), and due to the fact that life expectancy in women with breast cancer is increasing through advanced diagnosis and treatment methods (31), it is crucial to adopt measures for controlling the disease complications and improving the psychological well-being of the patients. Applying this therapy to improve the psychological well-being helps to reduce the risk of possible occurrence of mental disorders among these women. As mentioned above, it is crucial to provide breast cancer hospitals or specialty hospitals with counselors, so that patients benefit from psychological counseling as well as medical attention. Moreover, it is required to equip facilities to investigate psychological problems and help researches to improve the health of society. Novelty and advantage of the study is due to the fact that this is the first organized psychological research on the effect of an intervention on women's psychological well-being with breast cancer in Iran. The study suggests that patients with breast cancer undergo psychological well-being changes, so that their level of well-being and adaption show an alarming decline. Therefore, the results revealed that problem-solving therapy can affect psychological well-being of women with breast cancer. Note that sample group of our study consisted of all women with breast cancer who visited Shafa Super Specialty Hospital of Ahvaz, Iran (2017). Therefore, the results should be generalized with caution. The paper is derived from an M.A. thesis by Elham Taeidi on midwifery counseling, written in Ahvaz Jundishapur University of Medical Sciences and carried out in Shafa Super Specialty Hospital of Ahvaz. I would like to thank the personnel of Shafa Super Specialty Hospital of Ahvaz and the patients whose cooperation made this work possible. 1. DeSantis CE, Ma J, Goding Sauer A, Newman LA, Jemal A. Breast cancer statistics, 2017, racial disparity in mortality by state. CA Cancer J Clin. 2017;67(6):439-48. doi: 10.3322/caac.21412. [PubMed: 28972651]. 2. Mejdahl MK, Andersen KG, Gartner R, Kroman N, Kehlet H. Persistent pain and sensory disturbances after treatment for breast cancer: Six year nationwide follow-up study. BMJ. 2013;346:f1865. doi: 10.1136/bmj.f1865. [PubMed: 23580693]. 3. Cronin-Fenton DP, Norgaard M, Jacobsen J, Garne JP, Ewertz M, Lash TL, et al. Comorbidity and survival of Danish breast cancer patients from 1995 to 2005. Br J Cancer. 2007;96(9):1462-8. doi: 10.1038/sj.bjc.6603717. [PubMed: 17406360]. [PubMed Central: PMC2360185]. 4. Mousavi SM, Gouya MM, Ramazani R, Davanlou M, Hajsadeghi N, Seddighi Z. Cancer incidence and mortality in Iran. Ann Oncol. 2009;20(3):556-63. doi: 10.1093/annonc/mdn642. [PubMed: 19073863]. 5. Jagsi R, Pottow JA, Griffith KA, Bradley C, Hamilton AS, Graff J, et al. Long-term financial burden of breast cancer: Experiences of a diverse cohort of survivors identified through population-based registries. J Clin Oncol. 2014;32(12):1269-76. doi: 10.1200/JCO.2013.53.0956. [PubMed: 24663041]. [PubMed Central: PMC3986387]. 6. Heidari S, Rafiee F, Hoseini F. Correlation of perceived social supportive sources and the size of social network with quality of life in cancer patients. Iran J Nurs Res. 2010;22(61):8-17. 7. Joy AA, Ghosh M, Fernandes R, Clemons MJ. Systemic treatment approaches in her2-negative advanced breast cancer-guidance on the guidelines. Curr Oncol. 2015;22(Suppl 1):S29-42. doi: 10.3747/co.22.2360. [PubMed: 25848337]. [PubMed Central: PMC4381789]. 8. Bagheri Zanjani Asl Monfared L, Entesar Foumany G. The effectiveness of group based hope-therapy on increasing resilience and hope in life expectancy in patients with breast cancer. J Health Promot Manag. 2016;5(4):56-62. 9. Myers DG, Diener E. Who is happy? Psycholog Sci. 2016;6(1):10-9. doi: 10.1111/j.1467-9280.1995.tb00298.x. 10. Kirana PS, Rosen R, Hatzichristou D. Subjective well-being as a determinant of individuals' responses to symptoms: A biopsychosocial perspective. Int J Clin Pract. 2009;63(10):1435-45. doi: 10.1111/j.1742-1241.2009.02183.x. [PubMed: 19769700]. 11. Frisch MB. Quality of life therapy: Applying a life satisfaction approach to positive psychology and cognitive therapy. New jresey: Wiley Press; 2005. p. 407-21. 12. Hirai K, Motooka H, Ito N, Wada N, Yoshizaki A, Shiozaki M, et al. Problem-solving therapy for psychological distress in Japanese early-stage breast cancer patients. Jpn J Clin Oncol. 2012;42(12):1168-74. doi: 10.1093/jjco/hys158. [PubMed: 23081984]. 13. Akechi T, Okuyama T, Imoto S, Yamawaki S, Uchitomi Y. Biomedical and psychosocial determinants of psychiatric morbidity among postoperative ambulatory breast cancer patients. Breast Cancer Res Treat. 2001;65(3):195-202. [PubMed: 11336241]. 14. Nezu AM, Nezu CM, D Zurrilla TJ. Problem solving therapy. In: Dobson KS, editor. Cognitive and behavioral theories in clinical practice. 3rd ed. United States of America: Guilford Publications; 2010. 15. Antoni MH, Lehman JM, Kilbourn KM, Boyers AE, Culver JL, Alferi SM, et al. Cognitive-behavioral stress management intervention decreases the prevalence of depression and enhances benefit finding among women under treatment for early-stage breast cancer. Health Psychol. 2001;20(1):20-32. [PubMed: 11199062]. 16. van Dierendonck D. The construct validity of Ryff's scales of psychological well-being and its extension with spiritual well-being. Personal Indiv Differ. 2004;36(3):629-43. doi: 10.1016/s0191-8869(03)00122-3. 17. Bayani AA, Mohammad Koochekya A, Bayani A. [Reliability and validity of Ryff’s psychological well-being scales]. Iran j psychiatr clinpsychol. 2008;14(2):146-51. Persian. 18. Tsuchiya M, Horn S, Ingham R. Information provision and problem-solving processes in Japanese breast cancer survivors with lymphoedema symptoms. Scand J Caring Sci. 2012;26(1):53-60. doi: 10.1111/j.1471-6712.2011.00903.x. [PubMed: 21692823]. 19. Meyers FJ, Carducci M, Loscalzo MJ, Linder J, Greasby T, Beckett LA. Effects of a problem-solving intervention (COPE) on quality of life for patients with advanced cancer on clinical trials and their caregivers: Simultaneous care educational intervention (SCEI): Linking palliation and clinical trials. J Palliat Med. 2011;14(4):465-73. doi: 10.1089/jpm.2010.0416. [PubMed: 21413846]. [PubMed Central: PMC3070139]. 20. Lyons KD, Erickson KS, Hegel MT. Problem-solving strategies of women undergoing chemotherapy for breast cancer. Can J Occup Ther. 2012;79(1):33-40. doi: 10.2182/cjot.2012.79.1.5. [PubMed: 22439290]. [PubMed Central: PMC3660993]. 21. Hegel MT, Lyons KD, Hull JG, Kaufman P, Urquhart L, Li Z, et al. 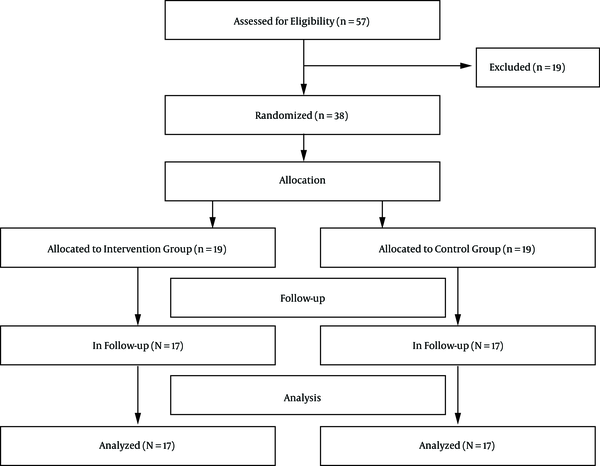 Feasibility study of a randomized controlled trial of a telephone-delivered problem-solving-occupational therapy intervention to reduce participation restrictions in rural breast cancer survivors undergoing chemotherapy. Psychooncology. 2011;20(10):1092-101. doi: 10.1002/pon.1830. [PubMed: 20821373]. [PubMed Central: PMC3005985]. 22. ForghaniTorfi AA, Javanbakht M, Biazi MH, Sahebi A, Vahidi S, Derogar K. The effect of cognitive behavioral model and reality therapy on students self esteem in Iran. J FundamMent Health. 2012;14(2):80-172. 23. Heidarianfard Z, Bakhshipour BA, Faramarzi M. The effect of cognitive behavioral therapy on social worriment, social autonomous and intellectual champ in students with social worriment disorder in Iran. J Clin Psychol Stud. 2015;6(21):152-75. 24. Isazadegan A, Sheikhi S, Hafeznia M. [The effect of cognitive behavioral therapy on autonomous and psychological health in obesity women, Iran]. Urmia Med J. 2015;26(9):785-92. Persian. 25. Modarres M, Mohseni H, Shiran-Noogi P. [The comparison of the effectiveness of problem solving skill education with two methods of workshop and educational booklet on interpersonal communication of midwives]. Res Med Educ. 2017;9(3):28-19. Persian. 26. Seyedmoharrami I, Pashib M, Tatari M, Mohammadi S. [The effect of cognitive-behavioral group therapy on achievement motivation and academic failure students among students of university of medical sciences]. J Torbat Heydariyeh Univ Med Sci. 2016;4(1):17-23. Persian. 27. Omrani S, Mirzaeian B, Aghabagheri H, Hassanzadeh R, Abedini M. [Effectuality of cognitive-behavioral therapy on the life expectancy of patients with multiple sclerosis]. J Mazandaran Univ Med Sci. 2012;22(93):58-65. Persian. 28. Moatari M, Soltani A, Mosavinasab M, Aiatolahi AR. [The effect of a short term course of problem solving on self-concept of nursing students at shiraz faculty of nursing and midwifery]. Iran J Med Educ. 2005;5(2):147-55. Persian. 29. Bayat E, Rahimian Boogar I, Talepasand S, Yousefichaijan P, Hamidi Z. [Effect of family-based cognitive behavioral therapy in modification of self-image associated with obesity among children]. J Mazandaran Univ Med Sci. 2016;26(137):115-27. Persian. 30. De Aguiar SS, Bergmann A, Mattos IE. Quality of life as a predictor of overall survival after breast cancer treatment. Qual Life Res. 2014;23(2):627-37. doi: 10.1007/s11136-013-0476-8. [PubMed: 23873516]. 31. Berger AM, VonEssen S, Kuhn BR, Piper BF, Agrawal S, Lynch JC, et al. Adherence, sleep, and fatigue outcomes after adjuvant breast cancer chemotherapy: Results of a feasibility intervention study. Oncol Nurs Forum. 2003;30(3):513-22. doi: 10.1188/03.ONF.513-522. [PubMed: 12719750].